A demo day is in the diary at Raglan Parc Golf Club for 3rd August - 12.30 to 3pm. Contact the Pro Shop for info. Great opportunity for members, visitors and invitees to come along and be custom fit for a SeeMore Putter and try the range of heads to find the one that suits them. Also they can try the revolutionary Rosemark Grip. There is no obligation to buy. SeeMore Putters offer golfers the #1 alignment putting system in golf. SeeMore’s patented RifleScope Technology (RST), known by a visible gun sight on the top line, allows the golfer to set up the putter perfectly each and every time in relation to the intended target line. This is accomplished by lining up the black bottom portion of the shaft between two white lines and covering a signature red dot on the heel of the top line. The process is like locking radar onto a target. The two parallel white sight lines frame the shaft and serve as an indicator that the golfer is in perfect position to make a consistent and reliable stroke. SeeMore has been a revered putter brand for over 15 years. SeeMore originally became recognized when Payne Stewart won the 1999 U.S. Open playing a SeeMore putter in the greatest clutch final round putting performance in US Open History. The brand was re-launched in 2007, and immediately regained worldwide prominence as Zach Johnson used a SeeMore FGP to win the 2007 Masters. 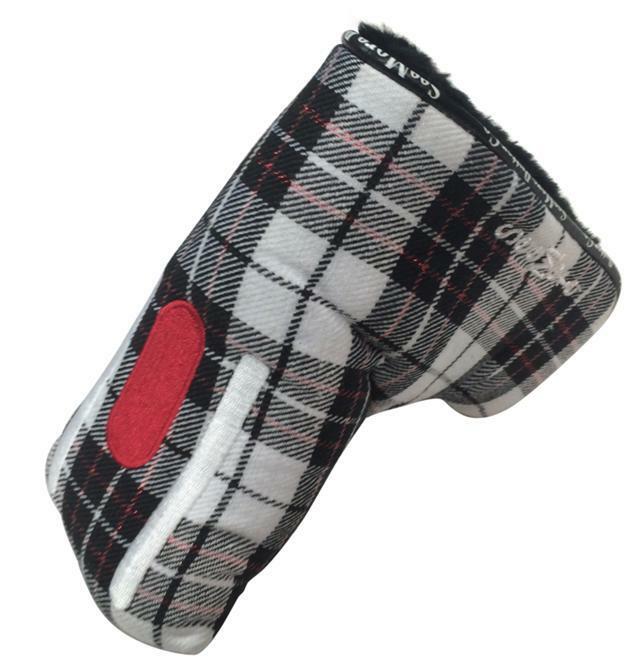 Rosemark putter grips provide tension free putting with greater control. All Rosemark grips share the same patented and premium design of a beautifully textured, tapered shape in several sizes with multiple angles in a hexagon shape around the grip, which completely conform to the shape of a hand. Rosemark helps the golfer set up square and keep the putter head square at set up and during the stroke, with the same minimal grip pressure that the best players in the world use. Rosemark putter grips came into great prominence during 2015 and 2016 as they were used by several of the best golfers on the planet, female World #1 Lydia Ko as well as PGA Tour World top 20 player Russell Knox. Ko won 2 Major Championships and 7 tournaments worldwide using the Rosemark 1.52 NextGen putter grip, while Knox won the 2016 Travelers Championship using the Rosemark 1.25 NextGen putter grip. We will be hosting a SeeMore Putter Demo Day at Monifieth/Ron McLeod Golf Shop on Thursday 19th July 2018. Working with Professional Lee Sutherland and the team we will have the range of SeeMore Putters and Rosemark Grips available to try and have a custom fitting. Starting at 10.30 am through to 3pm. Putting is said to be 40% of your game, so having the right set up, right grip, right length and a simple method to ensure consistency everytime and you should see your handicap going the right way. Book an appointment with the Proshop and we look forward to getting you on the road to a great putting experience. Pleased to announce a demo day for SeeMore Putters and Rosemark Grips will be held on Friday 20th July at Paul Lawrie Golf Centre. With the support of Craig and the team we will be able to custom fit the putter to be the right length, right lie, right loft, along with the grip that suits you. Putting accounts for approximately 40% of the game so with a consistent set up and method to putt with and the right tool in your hands, hopefully the handicap will only go one way! We will have the Tour Bag of putters with us to enable you to try the different heads and head materials. With different feel from different material the opportunity to try before you buy is a worthwhile experience. But there is also no obligation to buy. Commences at 3pm to 8pm. Pleased to announce a demo day for SeeMore Putters and Rosemark Grips will be held on Saturday 21st July at Kemnay Golf Club. With the support of Simon Hanson and the team we will be able to custom fit the putter to be the right length, right lie, right loft, along with the grip that suits you. Putting accounts for approximately 40% of the game so with a consistent set up and method to putt with and the right tool in your hands, hopefully the handicap will only go one way! Jamie Cundy is now on board as a SeeMore SPI Fitting Centre and is based at Calderfields Golf & Country Club. Long undulating greens and water hazards on no fewer than five holes characterise this mature park land course. Our signature hole- the 8th is just 376 yards, with one small pool to cross when teeing off and a final approach shot to cross the main lake onto the green, you will need a long straight drive, or you will not make par. Jamie is a PGA Fellow Professional, TPI Certified Level 1 & 2 and Plane Truth Certified Golf Coach. The first ever person to complete and pass the new ASQ Level 5 Golf Management Qualification. Fully qualified PGA Director of Golf and currently undertaking Level 3 UkCc Coaching exams. Completed AdCert (Advanced Certificate in Coaching) at Birmingham University in July 2016. When a customer loves the SeeMore Method and product they are quite happy to keep adding to their collection. Max ordered a MFGP Nashville SS Deep Flange with a specification of 35.25 inches, 71 lie angle, 2.5 degree loft and he then also added a White Tartan head cover and Iomic Black grip with 4 tape wraps. Order received 3/5 and it was custom built and despatched with us getting the following email from Max on 7/5. "Just wanted to let you know my putter arrived today. I've just been putting with inside on my putting mat, but as far as I can tell it seems perfect! Thank you very much again for the fast service! Max"
So pleased we can meet the exacting needs of our customers and deliver the service we strive to achieve. A demo day is in the diary at Sherwood Forest Golf Club for 20 May - 10.30 to 3pm. Contact the Pro Shop for info. A demo day is in the diary at Shifnal Golf Club for 26 May - 10.30 to 3pm. Contact the Pro Shop for info. A demo day is in the diary at Royal Birkdale Golf Club for 9th June - 10.30 to 3pm. Contact the Pro Shop for info. A demo day is in the diary at Ross Jackson Performance Centre for 10th June - 10.30 to 3pm. Contact the Shop for info. A demo day is in the diary at Vale of Llangollen Golf Club for 23rd June - 10.30 to 3pm. Contact the Pro Shop for info. A demo day is in the diary at Burnham & Berrow Golf Club for 4th August - 10.30 to 3pm. Contact the Pro Shop for info.